The swine flu epidemic has finally hit home. Well, not literally, thankfully. One of the elementary teachers from Roo's school was diagnosed and so were a couple of our neighbors. I suspect it's only a matter of time before H1N1 comes knocking at our door. That doesn't mean we'll give in, though! Aside from being slightly more stringent than usual about the kids' washing their hands, we haven't done much to avoid the virus this year. We haven't been vaccinated although if our county got the H1N1 vaccine in stock, I suspect even Bob would take it- and he's usually anti-vaccinations. I've been taking zinc supplements and trying to eat more fruit and drink healthy juices and so far I've been able to keep healthy. I've heard that oscillococcinum is a good way to keep colds and flu at bay. Has anyone tried it? 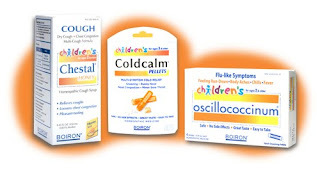 One2One Network has teamed up with Boiron, the world leader in homeopathy, to offer a $1 off coupon so you can try their new homeopathic medicines for kids: Children's Oscillococcinum, Children's Coldcalm Pellets or Children's Chestal.